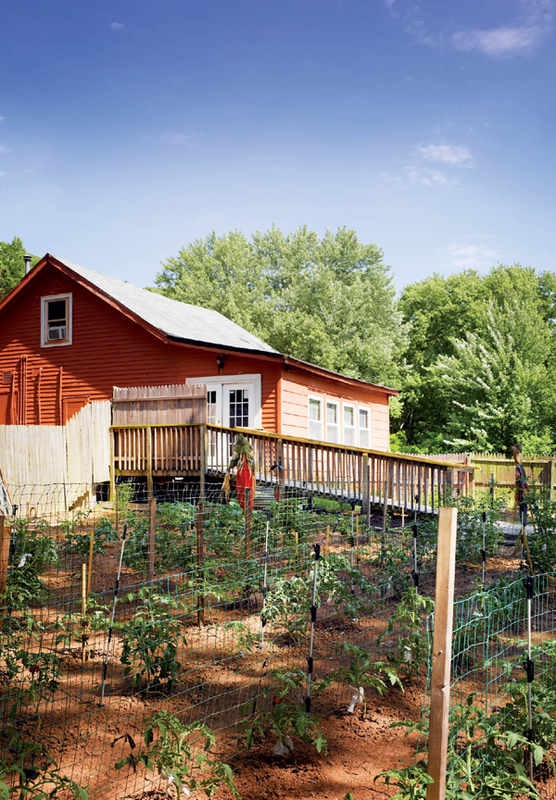 A big garden helps flavor the Creole and Cajun favorites at Anna Ree’s Andoille. One hundred and forty okra plants. That’s how many are planted in the second-year garden that Chef John Moore is standing in, which runs a third of the length and width of the acre of yard behind the New Richmond restaurant kitchen he commandeers, Anna Ree’s Andouille. The word restaurant seems limiting as I write it, for on most nights, Andouille—named after the spicy smoked pork sausage used in Cajun gumbos and jambalayas—feels like you dropped in on a neighbor’s excellent party. Besides formerly housing a biker bar (reportedly one of its many incarnations), the approximately 150-year-old roadhouse that sits along a verdant, semi-deserted stretch of the two-lane portion of U.S. Route 52 is perfectly suited to the cuisine that evokes the lusty, untamed character of the Big Easy. Certainly improvements and additions have been made since the 1860s, but it’s easy to imagine the small wood-frame building looking roughly the same as it did then. Inside, the patchwork of rustic dining rooms (one to the left of the entrance, one straight ahead past the bar) are comfortable but unremarkable, save for a bright splash of yellow paint, prints and photos of New Orleans, and the purple, green, and gold Mardi Gras beads strung over the bar. What distinguishes Andouille from most dining establishments is the yard that stretches to the bank of the Ohio River. The ramp descending from the back door is bordered on one side by the chef’s okra-laden garden, and on the other by an expanse of grass large enough for a pick-up soccer game (like the one that began with four kids and grew to 12 within an hour of our arrival). A couple dozen stools ring the Tiki bar positioned prominently at the end of the path. If you possess a major league arm you might be able to lob a rock from the fence into the river, the embankment between run riot in a lush growth of weeds and wildflowers. Tables—some picnic style, others of patio glass and shaded by outdoor umbrellas—are scattered throughout the lawn and atop the relatively modest platform of wooden decking. It’s at one of these tables, with a cold beer—perhaps Rivertown Brewing Co.’s Hop Bomber Pale Ale—and a bowl of smoky red beans and rice, that the day begins to slow and the alchemy of Cajun and Creole takes hold. Squint just so as the setting sun streaks the sky with pink and gold, and this could be the terrain known as the “trembling prairie,” the beautiful but treacherous grass-topped murky waters bordering the Gulf Coast that’s host to Cajun crabbers, hunters, and fishermen. Of course, the mirage could just as easily be fueled by the rum stealth of Andouille’s Level 5 hurricane cocktail (as hurricanes go, it’s well made, but be forewarned: this drink is a delivery system for sugar) and the strains of Creole funk administered by Robin Lacy and DeZydeco that burst from the dining room each time the back door opens. (On weekends, weather permitting, the party aura is fortified with live music on the lawn; Robin Lacy and DeZydeco were forced to play inside due to the threat of rain, which fortunately for us and unfortunately for them never materialized.) It is all very en famille, down to the kids retrieving the soccer ball from the garden. Andouille Chef John Moore is a veteran of local kitchens, spending a large portion of his 30-year career with chefs Jimmy Gherardi and Paul Sturkey at J’s Seafood, their show Everybody’s Cooking, and Pigall’s Café (Gherardi’s pre-Jean-Robert casual version of the former five-star restaurant with Formica-topped tables and paper placemats). With his longtime friend Chris Mullins, himself a restaurant management veteran, and Mullins’s sister Ellen Edwards, Moore and Co. opened Anna Ree’s Andouille two years ago this month. With a culinary background based in Italian and Mediterranean styles, Moore took Mullins’s direction (a devoted NOLA fan, Mullins has made an annual pilgrimage for many years), and pored over menus and books to get familiar with the Louisiana-born cuisine and its French roots. Like most chefs worth their salt, fresh ingredients matter to Moore, as evidenced by the mammoth garden. In addition to the okra, which is a natural thickener in gumbo, he grows pole beans, red and green bell peppers, eggplant, zucchini, squash, tomatoes, and a half-dozen fresh herbs. The okra isn’t just in the gumbo—milk-soaked, deep-fried nuggets are another reason he’s planted so much. The rest of the harvest appears in the menu’s Cajun and Creole specialties, the seasonal entrées like Moore’s handmade eggplant Napoleon (he couldn’t completely abandon his kitchen lineage), and the nightly features. There may be never-ending discussions about the origins of notable New Orleans dishes, but the one thing that’s set in stone is the importance of the roux—browning flour in fat—that lends each Cajun and Creole soup and stew its unique flavor. Moore’s gumbo is dark and smoky from a chocolate brown roux, and his étouffée mild and golden from a nut-colored roux. And while neither of them are unworthy of your fork, they fall short of transcendence, missing a subtle, mysterious quality that’s as much about the inventiveness of each cook as it is a recipe. Having worked alongside pastry chef Pam Sturkey for years, Moore picked up a thing or two, and he ends dinner on a sweet note. The dreamy, creamy mascarpone cheesecake is outstanding. So too is the lemon sour cream pie puddled with raspberry coulis and the excellent praline bread pudding with rum butter sauce (although I protest microwaving to bring it to temperature, which rubberizes the crumb structure). According to some saying somewhere in the annals of Cajun lore, the rules for entertaining are plenty to eat, plenty to drink, plenty of music, and plenty of cheer. Anna Ree’s Andouille follows suit with flavor, with gusto, and with graciousness. Originally published in the August 2011 issue.